This hotel is located near a shopping district and only 500 metres from extensive shopping areas. 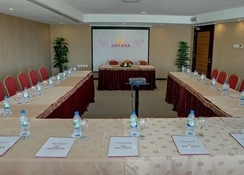 It is a 2-minute walk from Qanat Al Qasba and is a 10-minute drive from Al Mamzar Beach. It has an airport shuttle service available on request. Spacious rooms at the hotel overlook the lagoon. They have luxury bedding and feature large windows with black-out curtains. Each unit has free Internet access, air conditioning, and a work desk. 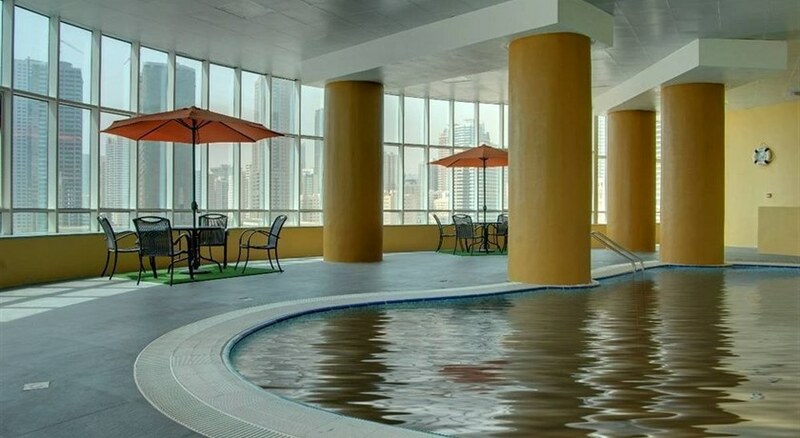 The hotel has an indoor pool with city views. 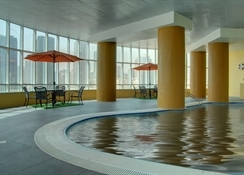 Guests can relax under an umbrella near the pool, or enjoy a free use of the fitness centre. International cuisine and local specialties such as Arabic bread and spicy stews are served at the hotel's restaurant. The hotel provides a buffet breakfast and can organise room service. Complimentary private parking is also available. This hotel features a restaurant, an indoor pool, and a health club. Free WiFi in public areas, free self parking, and a free shopping center shuttle are also provided. Additionally, a coffee shop/café, a snack bar/deli, and a sauna are onsite. Elegant rooms have city/lagoon views, and offer free Wi-Fi, flat-screen TVs and minibars, as well as tea and coffeemakers. Suites add dining tables, sofabeds and separate living rooms. Room service is provided 24/7. Set 12 km from Dubai International Airport, this imposing, upscale hotel lies within a 5-minute walk of both the corniche along Al Khan Lagoon and the lively Al Qasba entertainment complex.